The RC-200 Wall Base Cutter is designed to cut profile rubber wall base faster than a saw blade without the mess, dust, electricity or noise. Comes with a long lasting tungsten steel blade. 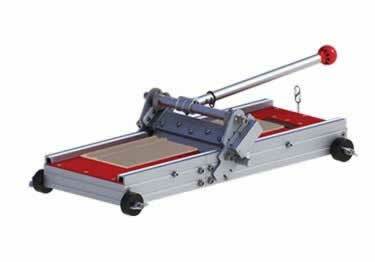 Capable of cutting straight or bevel cuts. Capacity for a straight cut is: 8" wide and 7/8" height. Capacity for a bevel cut is: 8" wide and 5/8" height. Each cut makes a half inside corner and a half outside corner. This Wall Base Cutter makes a precision cut on 45 degree, 22.5 degree, and 90 degree and features a quick-release locker for the cutting angle-change. Its four wheel design makes this unit easy to transport on the jobsite.